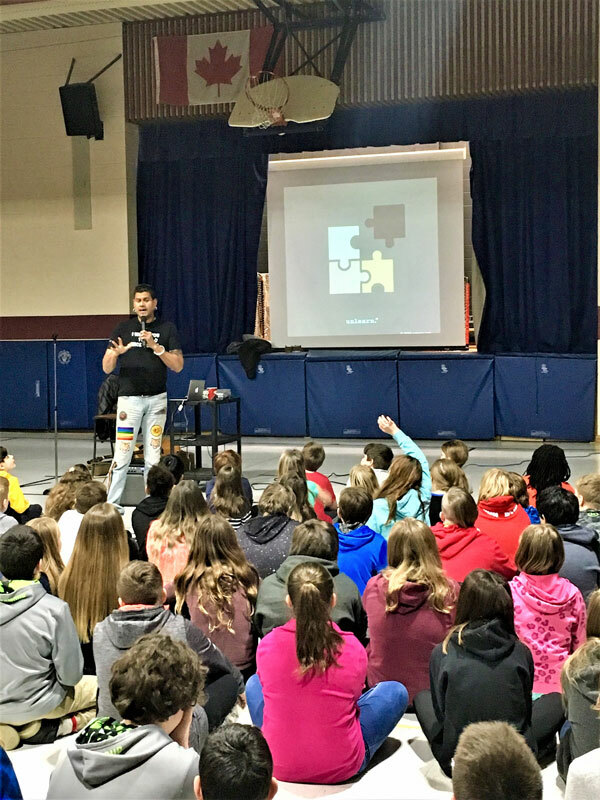 Treating each other with kindness, celebrating differences, and promoting love and dignity were the messages of the day at Delhi Public School and Teeterville Public School on Wednesday, February 20, when human rights strategist Chris D’Souza visited students and staff. Slowly, a few tentative hands went up. “Brown?” suggested a young student, with some trepidation. “Yes, beautiful brown!” replied D’Souza, who went on to ask students where they thought he might have been born, how old they thought he was, and what the crucifix around his neck might be about. These were not trick questions. They were intended to begin unpacking assumptions, biases, and stereotypes, and throughout the day with a series of presentations geared toward primary students, junior and intermediate students, and staff members, each group would confront hegemonic structures of racism, sexism, colonialism, and socio-economic status, while challenging all to be leaders who promote belonging and dignity – and it wasn’t meant to be a comfortable experience. “Educators either disrupt the status quo or replicate it,” said D’Souza, a former teacher, and current faculty member in Brock University’s Education program. The day was organized by the Parent Councils and staff from each school, and invited parents to join their children. Each age-appropriate presentation included songs and stories to promote inclusion and the celebration of differences for primary students, while challenging older students to understand leadership in terms of shifting their ways of thinking so others find the sense of belonging everyone deserves. D’Souza read from Chili Burn Me Tongue, a children’s book he authored which uses food to introduce concepts of cultural difference and belonging, and got students up and moving with songs such as “Shout Proud,” written to promote positive body image. The day ended with a meeting of teaching and support staff who create the safe, welcoming spaces that Grand Erie’s Multi-Year Plan espouses through its Well-Being indicator. For parents in attendance, the value in the day’s message was clear. As Pink Shirt Day approaches, a day meant to reduce instances of bullying by promoting kindness and acceptance, it’s the work that goes on year-round that allows Grand Erie to meet its goals of Success for Every Student.